where to buy a 14" non-glossy notebook without Windows in Germany ??? Ok, so because the old notebook is starting to fall apart (it is probably around 5 years old or so) I need a new one. So, I want to buy a new notebook, nothing too fancy: 14 inch, non-glossy, Intel Core Duo, Intel Graphics, Intel WLAN, 1GB RAM, price at most 800 Euro. I guess it's obvious to everybody reading this that I'd like to have fully Intel chipset because of the free drivers. This will actually be my first non-AMD CPU I buy new since 1994 or so. Read more about where to buy a 14" non-glossy notebook without Windows in Germany ??? text based presentation software ? I just decided for myself I should try to use a text based presentation software, since GUI-based presentation apps require you to think about what goes on which page from the beginning, usually you see only the current page, you have to think about the layout (fontsize, decorations etc. ), you have to use the mouse, etc. I remember that I heard several times of text or markup language based presentation tools, where you basically type some text in your editor, run the tool and then you get some presentation. I just can't remember any names. Preferably it shouldn't require latex. Read more about text based presentation software ? Rejoice - it has been done ! Although I didn't touch any significant number of lines of C++ code of KDE for the 4.0.0 release, the last (almost exactly) 2 years since I brought CMake to KDE4 (together with the help of many other developers, especially Laurent Montel !) have been very busy, impressive, awesome, stressful, interesting, rewarding, exhausting, etc. for me. I feel kind of relieved that it is now finally released (maybe the feeling is totally wrong and the stress now actually starts, we'll see). Read more about Rejoice - it has been done ! 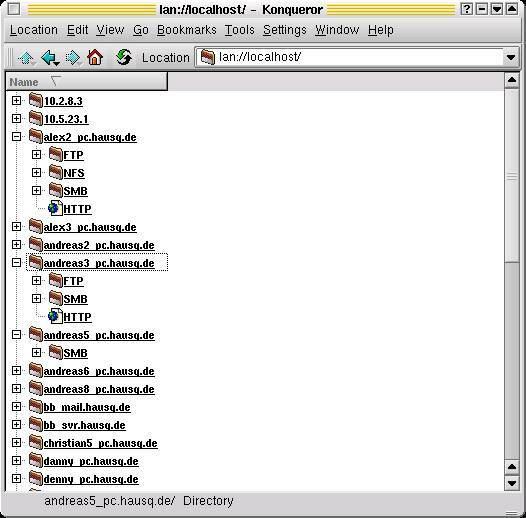 Around 2000 (back in KDE2 times) I wrote the so called LAN information server lisa (http://lisa-home.sf.net), which can you show the neighbours in your network. This works by regularly sending ping packets on the network. In order not to flood the network too much, if there are several of these daemons running in one network, they collaborate and reuse their results. Two weeks ago I moved again and it took until yesterday that I got internet access again, now using cable. This actually rocks, it is really fast, 6 Mbit/s. I still can remember, I think it was in 2001 I still had an analog modem with 100something kbit/s. That's really an incredible increase in speed in just 6 years ! I also got some more experience with WLAN under Linux, especially under Slackware 12. kwifimanager somehow didn't completely do what I wanted (and I didn't feel like reading a lot of docs), and knetworkmanager doesn't come with Slackware. CMake 2.6 will rock. Latest news: Clinton Stimpson has started to work on a Qt4 based GUI for CMake, so there will be a modern GUI to CMake also on UNIX, here's a screenshot from CMake cvs today: [image:3080]. The first commit is only a few days ago and it is already working nicely. Now that there is a GUI written with the best toolkit in the world ;-), there is a lot of room for cool features and improvements (ok, as cool as a feature for something as boring as a buildsystem can be... ;-) ). Maybe some of you have already noticed, I'm back in good old Germany. Since end of April I was in Clifton Park, New York, working at Kitware. This was a really great time. so since 6 weeks I'm now working at Kitware, Clifton Park, NY, USA. Since it's the first time that I'm in America this means a lot of new impressions for me. Friendly people, suburbs, beautiful nature, huge cars, baseball everywhere and much more. Are there actually any other KDE developers here in the Capital Region ? So what can I say about CMake (since this is of interest for KDE) ? Moving (temporarily) to Albany/New York... any KDE developers there ? Read more about Moving (temporarily) to Albany/New York... any KDE developers there ? do you still have CMake 2.4.3 installed on your KDE4 development system ? Then it's time to upgrade to CMake 2.4.5 or newer. Because starting Monday in a week, March 19th, at least CMake 2.4.5 or newer will be required for building KDE4.